Bitcoin Mining Costs in the U.S. Lately, bitcoin has been everywhere in the news. The cryptocurrency made headlines due to its dramatic rise in value over the past year. For most of 2017 and 2016, the value of one bitcoin hovered around $1,000 - $2,000. Towards the end of the year, the prices skyrocketed to $15,000 or more. While the prices have been in flux in the new year, news organizations seemingly can’t stop writing about it and people can’t stop reading and learning. People wanted to know how about the process -- how it works, what it’s used for, and then how they can get in on it. Mining bitcoin certainly isn’t cheap. Even just running one rig can use hundreds or more kWh per month. So how much is that actually costing miners? At Crescent Electric, we decided to find out. 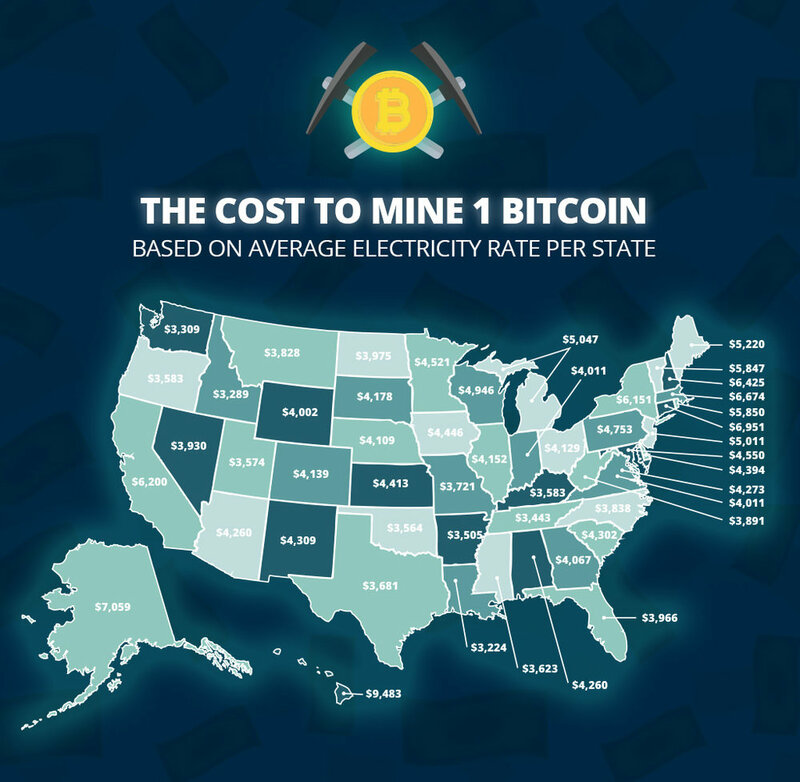 For this study, we wanted to look at how much it would cost to mine one bitcoin in each state. First, we identified three mining rigs to research: the AntMiner S9, the AntMiner S7, and the Avalon 6. Then, we put together the numbers on how many days it would take to mine one coin and multiplied it by the power usage. Based on the mining difficulty when these numbers were pulled in December 2017, the AntMiner S9 would take 451.91 days to mine one coin and use 14641.884 kilowatts. The Antminer S7 would take 1,301.79 days to mine one coin and use 37803.9816 kilowatts. And the Avalon 6 would take 1,807.63 days to mine one coin and use 45552.276 kilowatts. Bitcoin mining costs by state in the U.S.
Louisiana comes in as the cheapest state to mine at $3,224. Idaho, Washington, Tennessee, and Arkansas round out the top five, respectively. The most expensive state was Hawaii at $9,483 per coin. Alaska, Connecticut, Massachusetts, and New Hampshire came in as the next four. Overall, if you’re trying to get into bitcoin mining, where you live has a significant impact on your profit. And, rates within states can vary as well. It’s important to check with your local power company to see exactly what the rate is for your home. But, if you have a low rate, there could be some money to be made. Happy mining!